Claire's blog: O captains my captains! Well, I figured I might as well talk about my top 5 favourite male characters. It's going to be much much tougher. It's going to be terrible, I guess. Even worse than the 5 female character's I'd most like to be. Once more, I feel like I have to make excuses, so I'll just say it again: It's not classified in any kind of order, and it's just today's top 5, it's incomplete and some people who are not on it might very well turn out to deserve to be in it much more than those who actually are. Well, I guess I'd better just shoot instead of being terribly boring. 1. Captain Jack Sparrow. Yeah. Oh Captain, my Captain... Ultimately cool, really. Funny, witty, and incredible looking. I think it might well be my favourite movie character ever. 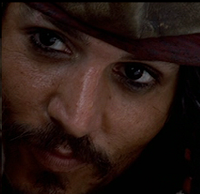 You just can't beat Captain Jack sparrow. 2. OK, so I'll start grouping people up, because otherwise I'm never ever going to make it. In the same bag, right here, I'll put Spike, (Buffy's Spike), because he's incredibly funny and carries the whole last season on his shoulders as well as many an episode with Riley the Endive in it. (Endive = Chiccory, by the way, I just checked that up in the dictionnary). He's English, too, by the way, and he's got a nice voice. Next in point two comes Malcolm Reynolds. It's in point two as well because it's a Joss Whedon Character. And next in point two (again) comes Han Solo, because I like him for the same reasons as Malcolm Reynolds, and I wouldn't want to have written them twice: they are strong and stubborn and more or less reliable, only you know they are when it really matters, and they are classy and fun, and they are at war with their respective beloved, (a Princess with LONG LONG HAIR for one, and a prostitute for the other) only everyone knows they love each other. In the end, I'm sure they'd have ended up together, in Firefly, if only Fox had given them time enough to get back together. 4. Now comes my Number 4, also called "cool englishmen". It's a really far fetched association, I'll admit (though, honestly, it doesn't seem as terrible as Rohit and Colonel Brandon), but I'd say Geoffrey Chaucer in a Knight's Tale (Ahhh, Paul Bettany!! He's just brilliant! The acce nt, the height (Taller than me!!) the class and the backside... ) and Dr Who. I don't know, they both look like overgrown asparaguses (asparaguss? apsaragus? asparaguzs? ), and one of them has got eyeballs twice the normal size, but I'll say it again, would David Tennant ever care to come knock on my door and ask me if I'd travel to the past with him, I'd say yes immediately. I think. Not to mention Paul Bettany. I'd probably do a little dance first (which might make him run away even before hearing my answer). 5. Inigo Montoya. From the Princess Bride. He's just brilliant. You want him to win so badly really. It doesn't happen too often, mostly revenge doesn't seem to me as a very valuable cause, but Inigo... I don't know. Maybe it's because of his cool speach, might explain it. "Hello, my name is Inigo Montoya, you killed my father, prepare to die". Clear and concise, explains it all... I give him a vote too. Now I hope Dr House never comes on this blog, nor Moulin Rouge's Christian and Much Ado About Nothing's Benedick, nor the Dead Poet's Society's Captain, nor Neo... ugh... I'm going straight to hell for being a terrible ungrateful person. Have a nice day! I'll go roast in guilt! (Et j'avais oublié de mettre cette phrase avant, d'où deux com en 2 minutes).